British men and women observe skilled Japanese artisans at work at the popular The Japanese Village exhibition in London. Published in the British weekly illustrated newspaper The Graphic on January 4, 1890 (Meiji 23). 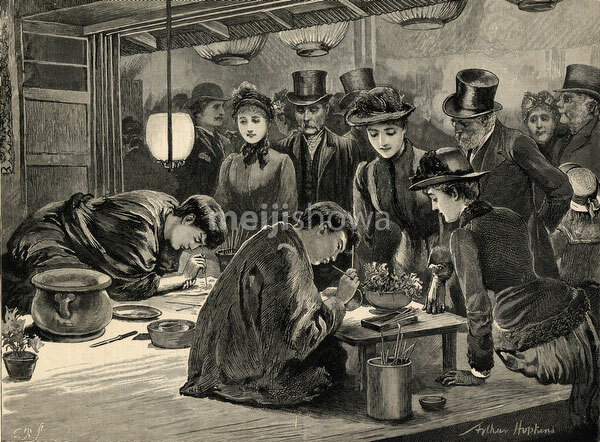 The exhibition was held at Humphrey’s Hall, Knightsbridge, from January, 1885 (Meiji 18) through June 1887 (Meiji 20). It resembled a traditional Japanese village with a tea-house, a Buddhist temple, and some 100 Japanese inhabitants. Over a million people visited. More info at Japanese Village Exhibition Opens in London (Calendar). 120419-0008 - New Year Customs | 120419-0011 - Views of Shimonoseki.